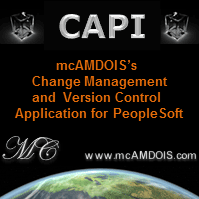 PeopleSoft can provide web services based on component interfaces (CIs) and the latest versions of PeopleTools even provide wizards for creating a component interface based web service. This wiki article goes through an example of providing such a web service for the message catalog component MESSAGE_CATALOG1. 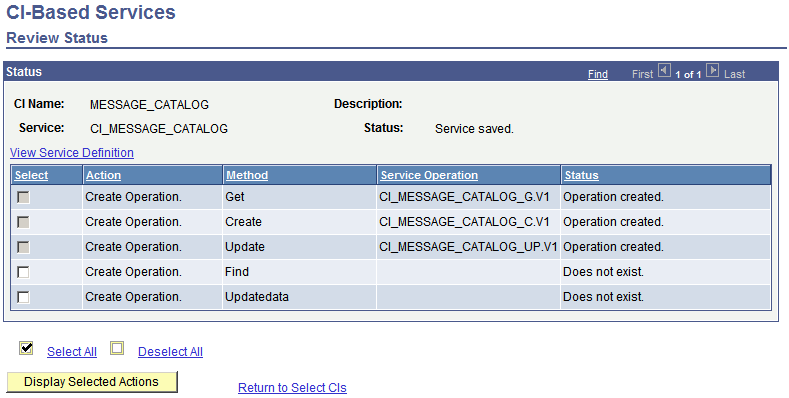 The first step is to create the component interface for the MESSAGE_CATALOG1 component. You should check if one already exists by opening your component and performing a find definition references in application designer. 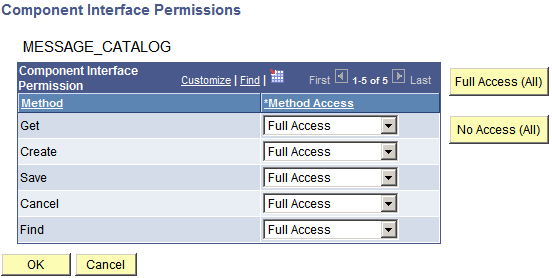 The next step is to provide security to the component interface through a relevant permission list that you have. This means editing the permission list and assiging component interface security to your component interface. First, find your component interface and select it. If you get an error stating "No component interfaces found with current search criteria." it means you have not set up security for your component interface or you don't have the access to the permission list that you set up the security for. Go back and check this. Select your component interface and press the Review CI Status button. Now you need to select the component interface methods that you want service operations created for. These are essentially going to be the methods that can be accessed through the web service. In this case, the get, create and update methods have been selected. 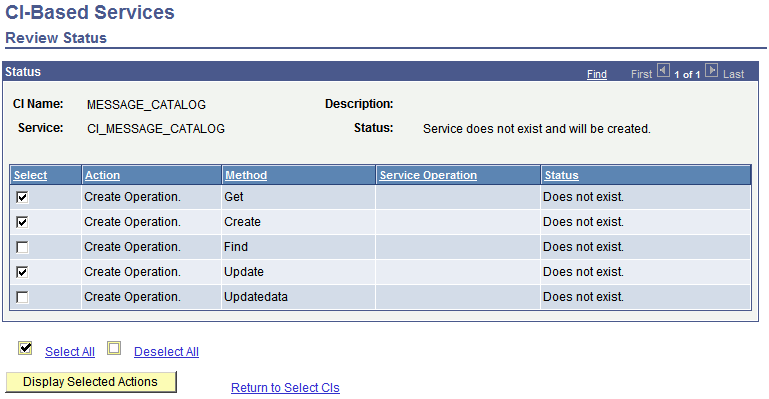 Press the Dispay Selected Actions button to see the service and service operations to be created. The service created will be your component interface name prefixed with CI_. Service operations will be created using the service name and suffix relating to the method and version of the service operation. Finally press the Perform Selected Actions button to create the service and service operations. Creates the WSDL (web service description language) for your service. First search for the service you created through CI-based services. 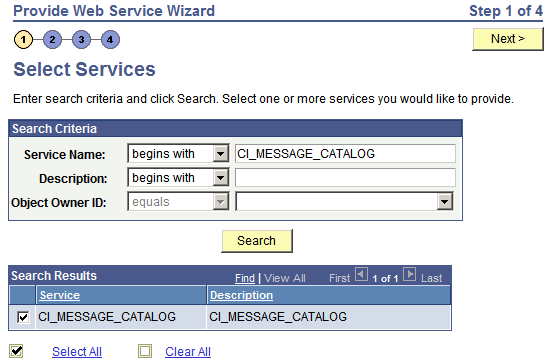 In this example, the service is called CI_MESSAGE_CATALOG. Select your service and press Next. Your service will have service operations which correspond to the relevant component interface methods you selected in CI based services. Select the relevant service operations you want to expose. Note that each will have request, response and fault messages automatically generated. A WSDL file will be created for your service. You can view it during this step. For reference have a look at this example file. 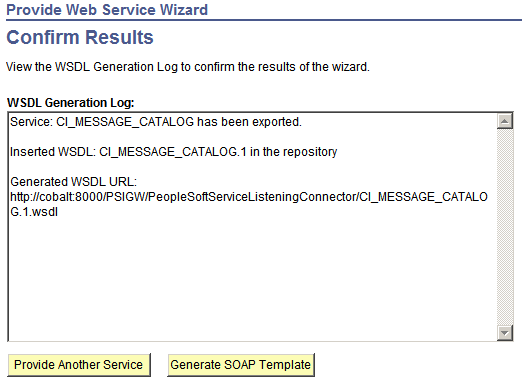 The final step is the wizard publishes the WSDL for your web service to teh PeopleSoft WSDL repository. Optionally you can publish to a UDDI (universal description, discovery and integration) server. The final page confirms the results of creating and publishing the WSDL for your web service. Most importantly it tells you how to acces your WSDL. Note that there is an exeption to this rule. If your default IB node points to a different gateway server than the local machine you need to include the default node at the end of the target location. To confirm your web service is ready, navigate to the URL of your WSDL. If contents of your WSDL file is returned then everything is working. If not, see the troubleshooting section below. See this article on testing web services with soapUI to learn how to test your web service. The first step is to check the error messages provided in the integration broker error logs. See this article on Integration Broker Logging for more information about how to do that. If you get an error using the default target location, try including the default node in your URL. The error message in the IB error log will look something like this and tell you that RequestingNode is a required field. This actually means that default user ID set for the ANONYMOUS node does not exist in the database. In my case, that was PSADMIN. Changing this to a valid user (PS) resolved the issue.